At Superior Healthcare, we’re here to help you with all your medical and healthcare supplies. If you’re looking for vinyl gloves, our wholesale provider would be happy to assist you. We provide vinyl gloves for home carers, medical facilities, veterinary clinics, dentists, aged care facilities, and much more. If you’re searching for vinyl gloves from wholesale providers, you’ve found the answer with Superior Healthcare. 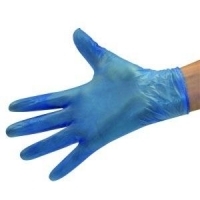 Our range of vinyl gloves are available in the classic blue colour and are perfect for food preparation. These gloves are a vital supply in many hospital kitchens, care homes, and even home care environments. Our powdered and powder-free gloves are available in a range of sizes and can be purchased in boxes with up to 100 pairs of gloves. For the perfect fit, feel, and dexterity, choose our ambidextrous vinyl gloves. Wholesale customers can rest assured that we only source and provide the highest quality of vinyl gloves. 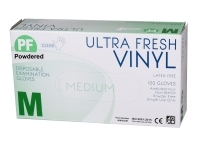 One of the leading brands we source vinyl gloves from is Ultra Fresh. 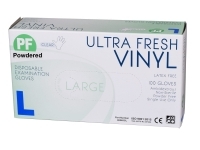 The vinyl gloves we supply are part of the wider range of Catering and Kitchenware products available from Superior Healthcare. We recognise the importance of food hygiene – especially in healthcare environments – which is why we provide a full range of kitchenware products to suit your medical needs. Our kitchen disposables include food containers and lids, napkins, forks, teaspoons and drinking cups. These products provide safe, easy, and convenient solutions for catering and kitchenware in a medical environment. We also stock a range of miscellaneous kitchenware and catering products, such as foil roll, tumblers, straws, double-handed mugs, insulated food bowls, plastic water jugs, and much more. If you have any quick questions about our range of vinyl gloves and kitchenware products, you can use our online chat to connect with our team. For more in-depth enquiries about ordering, discounts, delivery, dispatch times, and brands, it’s best to speak with our team directly. You can call us today on 03 8787 8222. Alternatively, we are also available on email at orders@superiorhealthcare.com.au. Our team would be more than happy to help you with your enquiry. Other resources you can use to find more information include our How to Order section. You can also read our information for NDIS providers or explore our blog to learn more about a range of topics. Alternatively, simply shop online now for your vinyl gloves to enjoy great wholesale prices and excellent customer service.